The digitizers were shattered, and since they were relatively cheap tablets to begin with, [sairuk] started thinking what could be done with a tablet that doesn’t have touch sensing anymore. He tried making an e-book reader for his kids, but somehow the idea of a MAME “cablet” (get it?) won out in the end. We’re not surprised: simple woodworking, gaming, and electronic hacking. What’s not to love? This writeup goes into a lot more detail, so check that out too. He and his sons built up cardboard prototypes first (we love cardboard!) and then transferred their plans over to wood for the final “rough cut”. A PS1 controller reads out the joystick and buttons, and a PS1 -> USB adapter plus a USB-OTG cable connects that to the tablet. They also removed the batteries and built in a permanent power supply. Everything is simple and cheap, but the results are still impressive. Although they claim their build isn’t finished to the utmost, it looks pretty darn good to us. We’re all frackers, so it’s satisfying to see a “junk” tablet put to good use. We’re wondering what [sairuk] is going to do with his other two tablets — we’ve got a suggestion for what he should do if he had twenty kids. The problem with click-bait titles, besides the fact that they make the reader feel cheated and maybe a little bit dirty for reading the article, is that they leave us with nothing to say when something is truly outstanding. But the video of [Tiburcio de la Carcova] building up a mini-Galaga cabinet (complete with actual tiny CRT screen from an old portable 5″ TV) is actually the best we’ve ever seen. 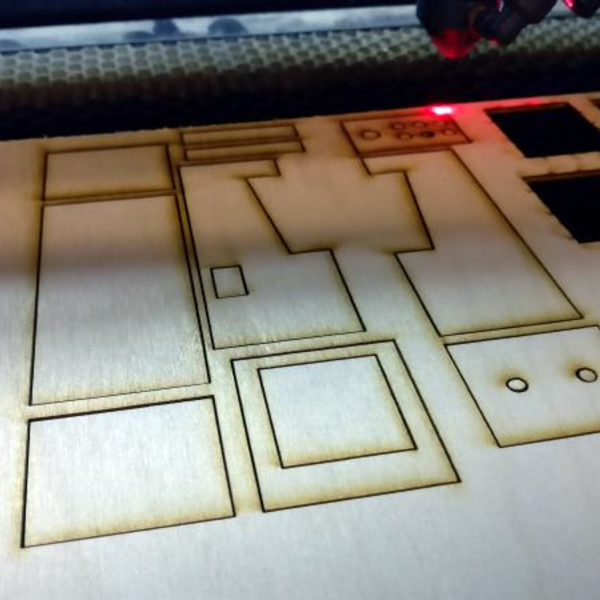 Plywood is laser-cut. Custom 3D printed parts are manufactured and assembled, including the joysticks and coin door. Aluminum panels are cut on a bandsaw and bent with a hand brake. Parts are super-glued. In short, it’s a complete, sped-up video of the cutting-edge of modern DIY fab. If that’s not enough reason to spend four minutes of your time, we don’t know what is. [Tiburcio] has also made a mini Space Invaders, and is thinking of completing the top-20 of his youth. Pacman, Asteroids, and Missile Command are next. We can’t wait. There are (ahem) a couple of Raspberry-Pi-powered video game emulators on Hackaday, so it’s a little awkward to pick one or two to link in. We’ll leave you with this build that also uses a small CRT monitor to good effect albeit in less-fancy clothing. Video game enthusiast [Mike] is all about the journey and not necessarily the destination. That is why he likes working on projects and documenting their progress with great detail. His bar top MAME machine is certainly no exception. One of [Mike’s] goals was to see if he could keep the look and feel of a large arcade cabinet but scale it down so that it was portable. He started with drawing up a model in Sketchup. Once satisfied with the layout and making sure everything would fit, the side panels were cut out of pine boards and will only be clear-coated. The remaining panels are cut from MDF as they will be covered in a matching decorative vinyl wrap. The control panel may look simple but a lot of thought went into it. Of course, there is a joystick but [Mike] chose to only use 4 game-play buttons. He did this to save space and estimates he’ll still be able to play 90% of the available MAME games. Those 4 buttons are illuminated and the MAME front end, Mala, was configured to light up only the functional buttons for the particular game being played. Front and center on the control board is a rotary encoder for playing games like Arkanoid or games requiring a steering wheel. In the end this build came out pretty nice looking. 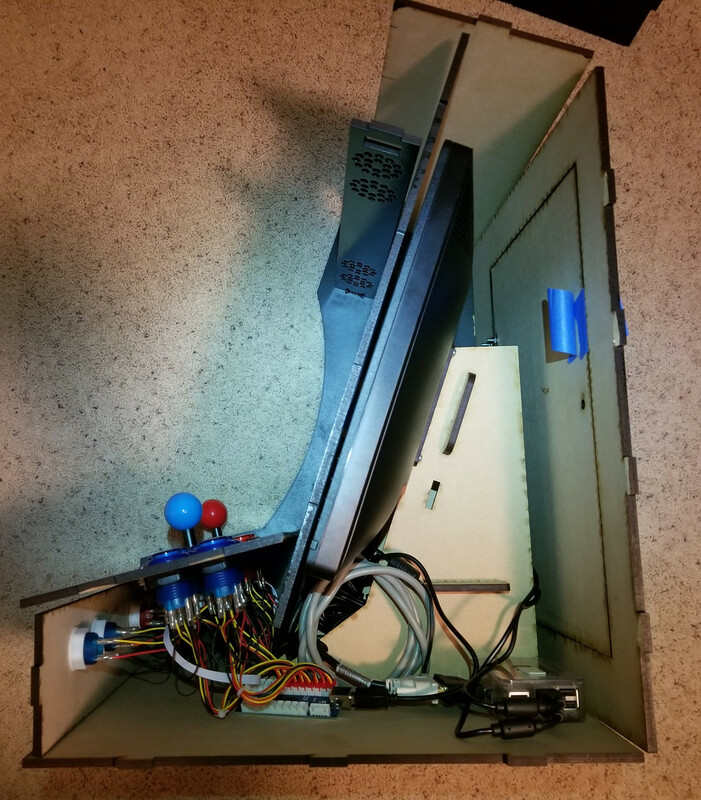 His build log is a great reference to hit before starting your next arcade cabinet project. Although [Mike] calls his MAME cabinet ‘mini’, it’s not the most mini we’ve seen here on Hackaday.